Many banks, particularly large institutions like Bank of America Corp (NYSE:BAC) and Citigroup Inc. (NYSE:C), have been on a cost-cutting binge for the last year or so, and one casualty has been bank branches. Indeed, as banks work to segue customers into online and mobile banking, many locations have been deemed an unnecessary drain on company resources. In 2012 alone, all U.S. banks closed nearly 2,300 branches, while opening only half that number. But, the reports of the death of branch banking have been greatly exaggerated, as it turns out. Bank branches are simply being reimagined, and new, more modern sites are being unveiled by Bank of America Corp (NYSE:BAC), Wells Fargo & Co (NYSE:WFC), and JPMorgan Chase & Co. (NYSE:JPM) even as clunky, older locations are shuttered. It’s true that over 2,000 branch closings is quite a bit for one year, but banks are realizing that it isn’t cost effective to maintain locations in sparsely populated areas. As those branches are trimmed, new, more technology-dependent locations are springing up in larger urban areas. Wells Fargo & Co (NYSE:WFC) recently opened a branch in what it calls the “neighborhood bank format,” in Washington, DC. Wells notes that the tiny, 1,000 square-foot site is a big change from its usual branch size, which is usually three to four times the new location’s footprint. The branch will offer large-screen ATMs as well as a paperless business concept, with employees using wireless phones and tablets to serve customers. JPMorgan Chase & Co. (NYSE:JPM) has introduced its own new branch style, with interactive ATMs as well as tablet-toting clerks and cash-counting machines. These modern improvements will eventually grace all of the bank’s new sites, but the company doesn’t plan to roll out the changes for current locations. 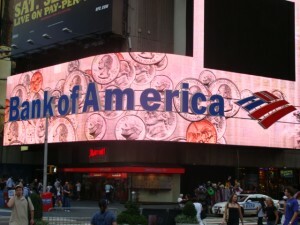 For Bank of America Corp (NYSE:BAC), its new branch concept has more riding on its success than just saving money. The bank will have all the accouterments of its peers’ snazzy new sites, though its footprint will be gargantuan — 12,000 square feet — compared to that of Wells. Bank of America Corp (BAC), SPDR Gold Trust (GLD): Will Obama Really Confiscate... Bank of America Corp (BAC), Citigroup Inc (C), Goldman Sachs Group, Inc. (GS... Bank of America Corp (BAC), JPMorgan Chase & Co. (JPM): Three Key Takeaways... Wells Fargo & Co (WFC), JPMorgan Chase & Co. (JPM): Seven Charts... Bank of America Corp (BAC), IBM and The Stock That Ruined Buffett’s Week... Facebook Inc (FB): Did It Launch the Branded Smartphone Phenomenon?